They'll be joined by the Charlie Daniels Band. COLUMBIA, S.C. — Country music legends Alabama are coming to Columbia for a concert later this year as part of their 50th anniversary tour. The band is set to perform at the Colonial Life Arena on October 3, 2019. They'll be joined by The Charlie Daniels Band. This is the first time Alabama's played at the Colonial Life Arena. The group has a strong connection to the Palmetto State: one of their first consistent gigs ever was playing at a bar in Myrtle Beach called "The Bowery." In the 50 years since starting the band, Alabama has charted 43 #1 singles, including 21 #1 singles in a row, and have won more than 179 CMA Awards, Grammy Awards, and ACM Awards. Among their big hits are "Mountain Music," "Forty Hour Week (For a Livin')," "Dixieland Delight," "If You're Gonna Play in Texas (You Gotta Have a Fiddle in the Band," and "Song of the South," as well as the Christmas classic, "Christmas in Dixie." They are members of the Country Music Hall of Fame and have their own star of the Hollywood Walk of Fame. Daniels, of course, is a country legend too, perhaps best known for his fiddle masterpiece “The Devil Went Down to Georgia." 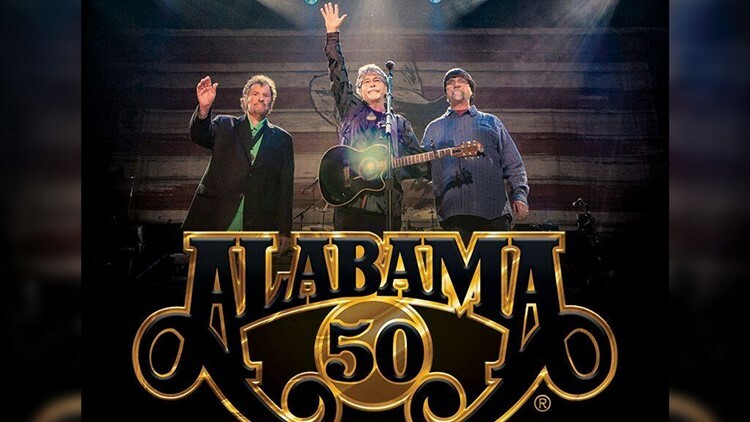 Tickets for Alabama 50th Anniversary Tour go on sale to the general public on Friday, March 29 at 10 AM and will be available at ticketmaster.com and in-person at the Lexington Medical Center Box Office inside Colonial Life Arena. Select presale tickets will be available through the Arena’s Cyber Club beginning Thursday, March 28 at 10 AM.